The pilot of flight BA038 Captain Peter Burkill gave this statement about the incident at Heathrow. 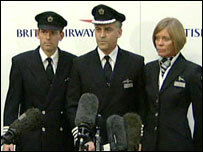 As British Airways flight and cabin crew, we are trained on a regular basis to deal with emergency situations. We have procedures to follow and everyone knows their role. Flying is about team work and we had an outstanding team on board yesterday. As captain of the aircraft I am proud to say that every member of my team played their part expertly yesterday, displaying the highest standards of skill and professionalism, no-one more so than my Senior First Officer John Coward who was the handling pilot on the final approach and did the most remarkable job. My first officer Conor Magenis also continually assisted. I want to pay tribute to the cabin crew and Cabin Service Director Sharron Eaton-Mercer who carried out the evacuation of the passengers with speed, efficiency and care, some incurring minor injuries in the process. It was typical of Sharon's selflessness that she took time to check that we on the flight deck were all right before going down the chute herself. I want to thank the passengers for their calmness and good sense in extremely unfamiliar circumstances. I wish those who suffered injuries a speedy and complete recovery. I also want to mention the fire crews, the ambulance service and the police for the huge part they played in dealing with this incident. As you know, an investigation is being carried out by the Air Accidents Investigation Branch so it's not possible for me to make any public comment on the circumstances of what happened.